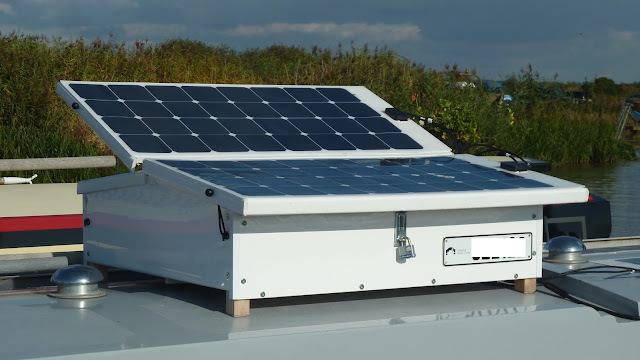 nb AmyJo: Solar panels and top box. Solar panels and top box. Warning - a slightly techy feel to this post. When Chris and I retire we want to go long term cruising and considered having Solar panels fitted to supplement our charging requirements for the batteries. Like most people we love our electronics gismos like mobile phones, laptops and such. All these take power and need charging so we knew AmyJo's power bank would need to be capable of supporting this. We had 6, 110ah batteries installed when she was built giving a total of 330ah of power at 24volts. Up to now this has coped quite well but we do spend a lot of time hooked up to the marina electrics to be fair. Our recent trip to the river Weaver highlighted the fact that unless we cruise for at least 5 hours ever day our batteries last barely 2 days before running low even when we are carefull with consumption. Monitoring the consumption we reckon we are using roughly 4amps of power on average which is quite high. This is down to the 240volt fridge and our need to charge phones, the internet wifi router (on a timer) and laptop use (I confess we are heavy internet users to keep in contact with family and friends). We do charge everything whilst cruising and the engine running and do everything we can to minimise power use where we can when moored. If we decide to stay put for a while this would mean running the engine a fair amount to keep the batteries fully charged. 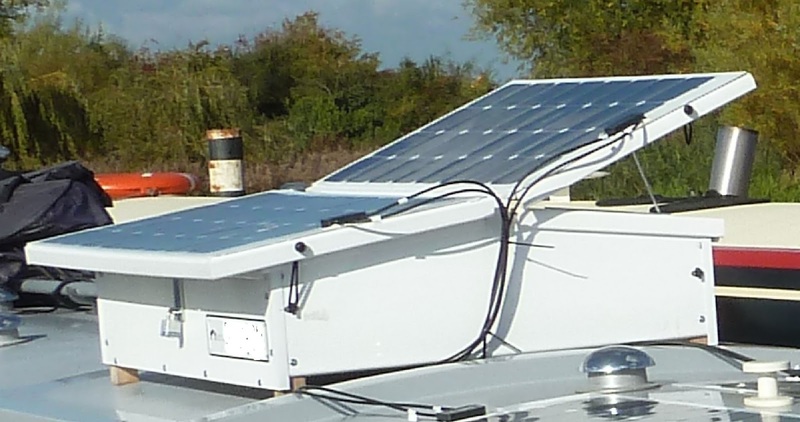 We looked at Solar panels as an option at Crick boat show and eventually placed an order to have them fitted. We also concidered how they would be fitted as neither Chris nor I wanted to use the normal brackets and have a line of panels running along the roof. Theres absolutely nothing wrong with that mind, its just we do not like that look. After much research we settled on flexible 100watt panels. We ordered four with a view to having them wired to give 200watt for our 24volt system. In actual fact fitting an MPPT controller meant we could have them wired up in series which is giving around 88volts on a bright sunny day and let the controller regulate the voltage to the batteries so 3.4amps has been achieved at times. I am now researching how I can set them up to pass the excess voltage to the inverter for mains use when the batteries are fully charged. That's a bit techy so I'll not bore you with that but it can be done with the Victron inverter assistant settings apparently. If you have ever researched solar panels the common advise seems to be they work best when tilted towards the sun, makes perfect sense to me. I took that into account and had two mounted on a home made top box to allow them to be tilted whilst the other two remained glued to the deck. This way when you see AmyJo you can barely see the panels unless the ones on the top box are tilted. Whilst not giving us 100% performance we still get good charging rates from them. We can also lift the deck ones onto another box later should we choose to do so at a later date. Our roof box, whilst admittedly not the cheapest to make, is, hopefully, almost maintenance free. Being made from uPVC soffet and fascia boards it only needs a clean now and again, with no need for painting or wood treatment. The inspiration for the box material came thanks to Barry on nb AreandAre. (click). He has made several storage roof boxes the same way and as we thought this was a great idea we set too to do the same. Thanks Barry for letting me have a look at yours. Being lightweight it remains to be seen how it fairs in strong winds but with the stuff we have put in it I doubt it would budge. The boards were sourced from B&Q and are 1.2m by 440mm in size, used for the base and lids whilst one 2m length of 220mm fascia served for the sides. The good thing about the soffet boards are they have a 30mm lip at 90degrees to the surface which, when two boards are placed back to back, makes bolting them together a breeze. Two more boards were shaped for the ends at 900mm wide and their lips enabled them to be easily bolted to the base boards. The sides were then fashioned from the fascia board with 50mm X 50mm timber used as legs to bolt them to the ends and raise the box to clear the curve of the roof. An additional feature is the 30mm lip acts as a great drip rail for the outer lid which I purposely made wider to over hang the box sides by adding another 100mm length of board making the width 540mm for each lid. The lids required a bit of thought and I confess not being an engineer, it took me a long time to come up with a working solution. I wanted to be able to tilt the solar panels but still keep the contents of the box secure. The answer was to have double lids each side. The difficulty was how to hinge them. 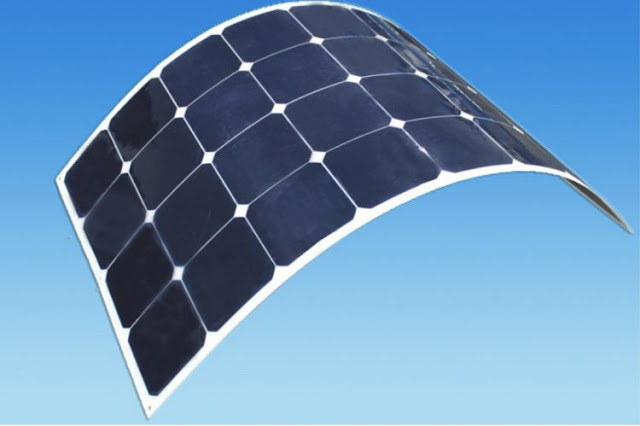 The solar panels are glued onto the upper or outer lid and this is hinged to allow up to 60 degree tilt. A strip of 20mm aluminium angle drilled at regular intervals and rod at each end serves as the support and allows the tilt angle to be adjusted. The angle bar is mounted on a lower second lid that when shut can be padlocked for security. We found we could still open this even when the solar panel is raised and tilted which is a bonus. The box is secured by the padlock but being plastic could be easily broken into so only low value items like the washing line, folding chairs and fenders are stored within. The finished box complete with solar panels, just need to tidy up the cables a bit more. Panels in the tilted position, the bungee on left corner holds them in place to protect them from the wind. The only down side at the moment is that to allow room to open and tilt the panels I have had to space them apart at the hinge side leaving a trough running down the length and at the top of the box. Currently I cannot think of a good way to make this water tight and still allow the lids to pivot but for now a good layer of white duck tapes seems to work well until a more suitable alternative can be found. Any Suggestions on this would be welcomed. 400w at 24v should mean around a maxiumum of 16 amps being produced on a good day. We get 10 amps with 200w without tilting the panels. I confess, these storms are all my fault!